L. Staius Murcus was a Legatus which struck coins in 42 BC. He served under Caesar in Gaul and Africa, and was present at the Senate House on the Ides of March and whilst he did not participate in Caesar’s murder, he approved of the deed. He was Praetor in 45 BC. 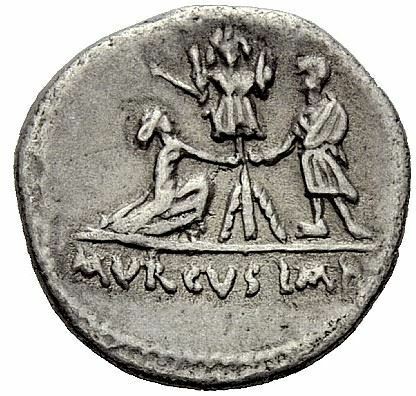 After Caesar was assassinated, the Senate sent Murcus to Syria as proconsul to help Cassius besiege Q. Caecilius Bassus. He was posted to blockade the fleet of Cleopatra as she came to the aid of Marcus Antonius and Octavian. D. Ahenobarbus was dispatched to assist him in this, and they formed a very successful partnership which resulted in dominance over the seas between Greece and Italy. However, following a dispute between the two, Murcus joined forces with Sextus Pompeius. He was apparently stubborn and uncooperative enough for his new ally to have him assassinated soon after.